1. Cohort Meeting at the district – All the other administrators at my level met to discuss items relating to our position. 2. My Son – Made it back to school about 9:15 to hear the news about the student who I’ve taken under my wing. I call him my son, because I’ve made a promise to myself to do everything I can to make this a successful year for him. Last year was no so great, and right away, he was making poor decisions that were going to get him kicked out of school – again. Unfortunately, he made some poor decisions at Saturday School, and he had to be suspended. It bummed me out. What a way to start the day. 3. Admin Meeting – I met with the admin team for about an hour to discuss events, plans, policies, etc. We have these meetings every Monday. 4. Scheduling – Made quite a few schedule changes for the upcoming trimester. 5. Spanish Only – Contacted two parents who spoke only Spanish to discuss a conflict that their sons had over a stolen bookmark. Are you serious? One parent used the phone of her son to contact the other boy. I had to explain to her the dangers of contacting a minor directly. 6. Technology Access - Created a tutorial in Spanish, so parents can check their child’s grades online. I’m learning that many Spanish-only parents want to know how their child is doing in school, but can’t navigate the school’s website to find out. I’m hoping to fill that need. 7. Apathy – Spoke to student whose mother came in to complain that he just doesn’t want to come to school. Most parents want to contribute to their child’s eduaction. Many times we jump to the conclusion that because we don’t hear from the parents that they don’t want to get involved. As a teacher, I learned that often the language barrier can prevent them from making the effort. 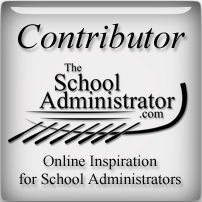 As an administrator, I’m seeing the same thing. How do you handle stress? Today was one of those days that made me feel a bit stressed out. There was traffic on the way in. I had a lot to get done, and too many meetings, plus I was bummed out about what was happening to the student who I had invested so much time into. Still I was too busy to go for a walk. I’d be interested to know how other administrators handle stress.